If you have children ages 3-6 who are learning to read, Super Why is a great show for them. If you aren’t familiar, the story book characters have a dilemma and then enter a story book to find a solution. Along the way they help the other characters in the story books using their reading abilities. Each character has a different reading speciality. Alpha pig knows his alphabet, Wonder Red knows her rhyming words, Princess Pea is good at spelling and Whyatt can read. Not only does it help with reading but each story has a great lesson. In the story, “‘Twas the Night Before Christmas,” not a creature was stirring…except for Whyatt, who has an important question for Santa! 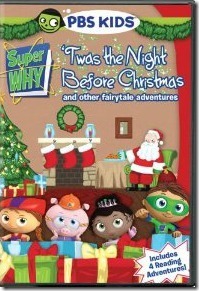 So Super Why and his friends catch up with Santa and his reindeer as they gallop from rooftop to rooftop and unravel the mystery of Santa’s childhood, discovering along the way how to help spread the magic of the holiday. The DVD includes special features such as interactive games, music videos and printable activities and colouring pages.